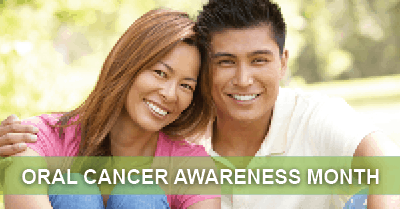 Every April, the dental community observes Oral Cancer Awareness Month and works to increase public awareness about a dangerous and deadly disease. The truth is, according to the American Dental Association, an estimated 42,000 people will be diagnosed with oral cancer this year. With a number this high, I want to take this opportunity to educate the patients of my Long Grove dental office on the risk factors and symptoms of oral cancer as well as how early detection can help save your life. When talking about something as serious as oral cancer, I want to make sure my patients understand that, while this disease can be fatal, it’s not because the disease is difficult to treat. Many oral cancer cases are not diagnosed until the cancer is later in development and more widespread, which results in a high percentage of fatalities. That’s why I try to encourage my patients to not only limit their exposure to the risk factors that can contribute to oral cancer, but also to perform at-home checks and, most importantly, keep up with their regular checkups at my Long Grove dental office. There are several risks factors that can increase someone’s chance of developing oral cancer. It’s probably no surprise that tobacco use is the number one leading cause of oral cancer. However, what may not be so well known is that an individual’s chance of developing oral cancer greatly increases if they’re both a tobacco user and a heavy drinker. Additionally, the sexually transmitted disease known as the human papilloma virus (HPV) can also lead to oral cancer. In addition to avoiding the risks associated with oral cancer, performing self-exams each month is a great way to catch any potential problems early. When examining your mouth for signs of oral cancer, simply find a mirror and a bright light and look at the inside of your mouth, including the cheeks, roof of the mouth, lips, and gums. What are you looking for exactly? Some of the most common signs include white or red patches of oral tissue, a sore that doesn’t heal on its own, an abnormal lump or thickening of the mouth tissues, and difficulty swallowing. While checking your own mouth for signs of oral cancer is helpful, it’s still very important to maintain regular checkups with your Long Grove dentist. Sometimes oral cancer may not seem to show any signs in its early stages. However, our team is trained to know what to look for to catch oral cancer early, and early detection gives you the best chance of survival. If you’re experiencing any of these symptoms, or if you’re due for a checkup, call my Long Grove dental office right away. After all, it just might save your life.